is an ancient breed. There are written reports of them as far back as 1600. For hundreds of years, they were common on the northern, rocky coastal areas of Norway. The farmers used them to hunt Puffin birds which nest in the hills and cliffs there. It was common for every household to have numerous dogs. When hunting the birds became easier by other means, due to the modern methods of the nineteenth century, the Lundehund lost its job and became less common. Outbreaks of canine distemper virus and the protected status of Puffins almost finished them off. In the sixties, the breed was rescued from near extinction by several dedicated Norwegians. Lundehund breeders and owners can be found in most European countries. In the late eighties, the breed was imported to the United States and Canada. 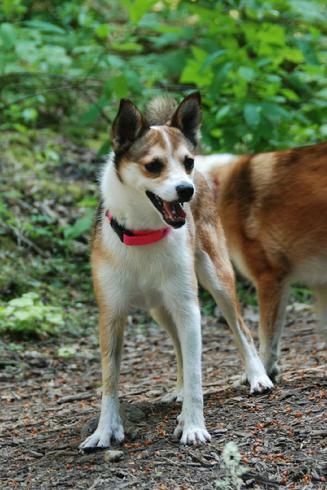 Curious, intelligent, but very stubborn, the Lundehund is an adaptable, fun-loving dog who gets along with adults, kids, and other dogs if they were raised with them. If you introduce an adult to new dogs or children, when that Lundie has never been exposed to them, they may be apprehensive, depending on that Lundie's socialization and personality. They certainly relish being outside and running, but at heart, they are a people loving, inside house dog. They thrive in a multiple dog household, but also as single pets. Both homes and apartments are suitable for them, but a house with dog door access to a yard is ideal. Their temperament is happy and calm, yet alert. They are alarm barkers and it can take little to alarm them. But unlike some breeds, they don't bark all day at the wind. Active and playful, they are happy to curl up beside you and rest when all the excitement is over. They love to sleep under, on, or in their owner's bed, but a kennel crate is quite acceptable. Puffin Dogs are unique in having five functional toes on their front feet (with their dew claw, that makes six toes on each paw). This allows them to climb better than most dogs, so watch out for your tables and the top of your couches. They are unique in being extremely flexible in their neck and shoulder joints, so that they can fit into tight and narrow spaces. To avoid getting water in their ears, they can shut them quite tightly. Their sable and white coloring makes them look very fox-like and un-like any other dog breed. 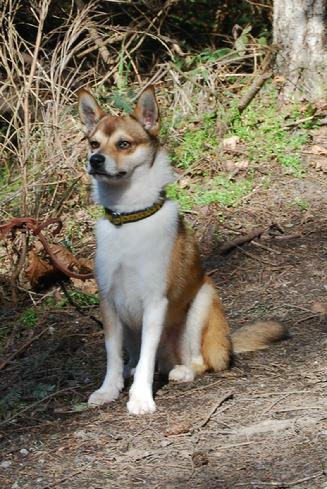 A Lundehund's small size of about 12-18 lbs. makes them adaptable to apartment living, but in that case, they need to run and use up energy on long walks. Their two-layer coat is weather resistant, but they are not outdoor-only dogs, needing to stay with their family. Being a primitive breed, you will see them exhibit 'caching' behavior, hiding kibble, treats, bones and toys all over the house. I have found that they are very hard to house train; they are not for the novice dog owner in that respect. Having a crate/kennel is usually a must. I believe that hundreds of years of living in barns in Norway made their nature less amenable to the process of house training. I send a booklet on house training with all my puppies. They are prone to an intestinal syndrome, which is a mixture of lymphangiectasia, inflammatory bowel disease, and small intestinal bacterial overgrowth that causes a malabsorption and protein losing enteropathy. The symptoms can be any or all of the following: weight loss, vomiting, diarrhea, or bloated stomach. Most Lundehunds will get sick with it several times during their lifetime. But these days we know a lot about the illness. We can test for an attack with low priced tests. If we catch it in the early stages, it can be successfully treated with not too expensive medicines. If properly looked after and stress is minimized, a Lundehund can live to be 10-14 years old. On the plus side, as far as breed-related problems, this is about the only illness that they do get. Every purebred dog/cat comes with some bad genes attached to the good genes that make the dog look they way they do. Boxers and Golden Retrievers get cancer at a relatively young age. Labs get cataracts and hip dysplasia. Scotties and Corgis get hemophilia. Cockers get severe eye and skin infections. The list goes on and on. Keeping Lundies on special intestinal diets, watching their health status and catching an attack early, (as well as lots of love and care) helps them live long lives. See History and Medical Pages for more information. Lundehunds are great companions; large enough in size to take part in any activity an owner would wish to do, yet small enough to sit on a lap when needed. A short coat minimizes shedding and grooming chores. They love staying at home as well as traveling in the car and live happily with either families or a single person. Loving care, proper housing, attention to their unique personalities and health needs will give you a wonderful companion for many years.